This saves time on clean up after frying anything in a fry pan, big or small. It has saved cleaning my stove's back splash. I would recommend this item to anyone who enjoys cooking. I use the splatter shield whenever I am making anything greasy that will splatter. My Mom gave me my first splatter shield eons ago and I even have one that I take to our time share. Don't leave home without it!! Each of my daughters have one in their home also. I have been looking for something to contain the splatters when frying on the stove. This keeps my clean up to a minimum. My husband & I love it. I bought an extra one for my daughter and our camper. I use mine when I fry chicken in the electric skillet to keep the grease from splattering on my canisters. Keeps grease off the walls in our small camper. I won't fry without it. Very easy to use and it's easy and convenient to store. The stove is next to the wall in my small kitchen, so this works well. a good kitchen item. Wish I would have had it years ago. Prevents a mess on my cooktop. Saves cleanup time. I was very pleased with this item. I ordered two as sometimes I have 2 messy things cooking at the same time. They both fit on the stove and protect the walls, stove and me from greasy splatters that build up and become very difficult to clean over time! IT WORKS PERFECTLY WHEN I AM COOKING BACON AND BROWNING FOODS ON THE STOVE. IT PROTECTS MY COUNTER TOPS AND MY FLAT TOP STOVE. Very easy to clean and does the job very well. Don't know why I waited so long to purchase this. Love it when I'm frying something, keeps the splatter to a minimum and allows for less clean-up afterwards. I had one years ago but misplaced it.I had been looking for one to help with the splatters on the stove while cooking. So far I've used it once and love it. My brother-in-law uses his for the stove. But I use mine for my grill. I have a side burner on my propane grill and this helps keep the wind from blowing the flame out. This has helped cut down on the grease spattering from our Jenn-Air grill. I have had these shields for over 20 years. I think I purchased the first one in a hardware store, but never seen them since. Thank you for carrying them..... I keep in the cupboard, easy to get out. Sometimes, I just wipe them off. Dishwasher does a great job, too. It saves an amazing amount of time and mess when you clean off your range top. Can't say any more. I know they are kind of silly looking and old fashioned, but if you like kitchen "gadgets," it doesn't get any better than this!!! i keep this, folded, on top of my stove and use it almost every time i cook something. has cut my clean up time to almost nothing. for my homemade spaghetti sauce ii use this and an over-the-pot splatter screen and there is absolutely no clean up after a few hours of simmering. Use to protect counter from spatters while cooking. Works great! I use it to keep my walls clean in my small motor home when cooking ,,, for I can not get the grease off the walls but with this little thing i can just set it to water and soap and ta da clean again. My husband is my chef but I do the cleaning. Sometimes, no matter how careful he wanted to be, it used to be frustrating to do the cleaning, especially after a good meal. My frustration ended about 15 yrs ago when this company decided to mail me a catalog and I found my problem solver "THE SPLATTER SHIELD". Since then, I always keep more than one in the kitchen. Saves me a lot of time as I do not have to cleanup my stove top as I had to before the guard. This really keeps my stove from being splattered so much, therefore cleanup is quicker. I ordered other items with this order and I am verty satisfied with all itens. I have been dealing with Walter Drake for many, many years and I have been very satisfied with everything. They are very nice and very fair to deal with. I refer all my friends to them. Use almost daily. Adjusts to any size pan. This really helps to keep my stove from being splattered so much. Easy cleanup. I have a new cook top and everytime I cook, especially frying, grease goes all over the stove and countertop. When I saw this item, I was hopeful that it would alleviate some of the mess. It does and am thrilled that you made it so easy to clean and store - that's a homerun in my book. Kitchen clean-up usually takes the longest time in cooking, and you have made it a lot easier. When frying I surround pan with it. When finished cooking, there is still some grease spatter, but only near the burner and on the spatter shield. You still haveto wipe the shield. This is my 2nd one and I really recommend it. We absolutely love your Splatter Guard! I use this to keep splatters off the stove top...especially when frying. The edges on this guard are curled so there are no rough edges to worry about using it on your stove. Cleanup spray after use with some Fantastic and grease wipes right off. This is a great stove saver -keeps grease from flying all over stove - makes clean up easy. Folds flat and easy to store. No sharp edges. Great durable metal construction. Easy dishwasher clean up. I love it! This is a real good product!!!!!!!!! The second one I have bought!! I owned a splatter shield but it got lost when I moved. When I saw it on-line, I jumped at the chance to get another. It saves a lot of clean up when cooking, or frying. I use it around a sauce pan or a skillet. When it gets soiled I just spread it out in the dishwasher and it comes clean without a lot of scrubbing. I love it. Was afraid to get a shield after reading another website review of how flimsy and rusty the shield gets. However, THIS shield is coated with a nice neutral greyish taupe color instead of a shiny metal finish and is fairly solid for how thin it is. I may order another because I use the shield for both the stove and for the back of the sink to keep sink window and walls free of splashing. Haven't used it in dishwasher yet because am constantly using it. Wipes up so clean with a damp paper towel and a TINY bit of foamy soap. I mostly use this splatter to prevent my gas range from the wind, so it doesn't go off. It's easy to clean and to store. I use this item every time I fry something. I have a black stove that seriously needs this splatter shield! Good price. I have a glass electric stove top & get tired of having to clean the whole thing every time I cook anything! I remember my mother using something like this many years ago. I decided to give it a try. Helps to keep stove top free of grease and splashes. I have a gas stove and the splatters are hard to clean . It may help eliminate a lot of grease splatter throughout the entire stove top when cooking meats such as hamburger and any other meats that emit a lot of grease. Been looking for this product for years. Have a much older model that I really like. Best splatter shield that I have ever had. I have two already...a coated one (which I'm not fond of) and an aluminum one which is much easier to clean in DW..but the coated was all that was available. Good shield. Use it every time I cook. Small area in camper and want to minimize grease splatters. Keep my stove clean when cooking certain items which can splash. My Mom recently moved and misplaced hers in the process. We always have to clean up after any kind of frying. This should eliminate the hard work. I've had one for years and am getting a couple for friends. I chose this because it is what I was looking for and it seems well made, not flimsy like the aluminum I own previously. Had one before, and they do a great job. I have a nephew the cooks and Splattered food all over my stove. Seems like a good concept. We make spaghetti a lot. I’m excited to have less mess to clean after I cook! Save from cleaning to whole stove! 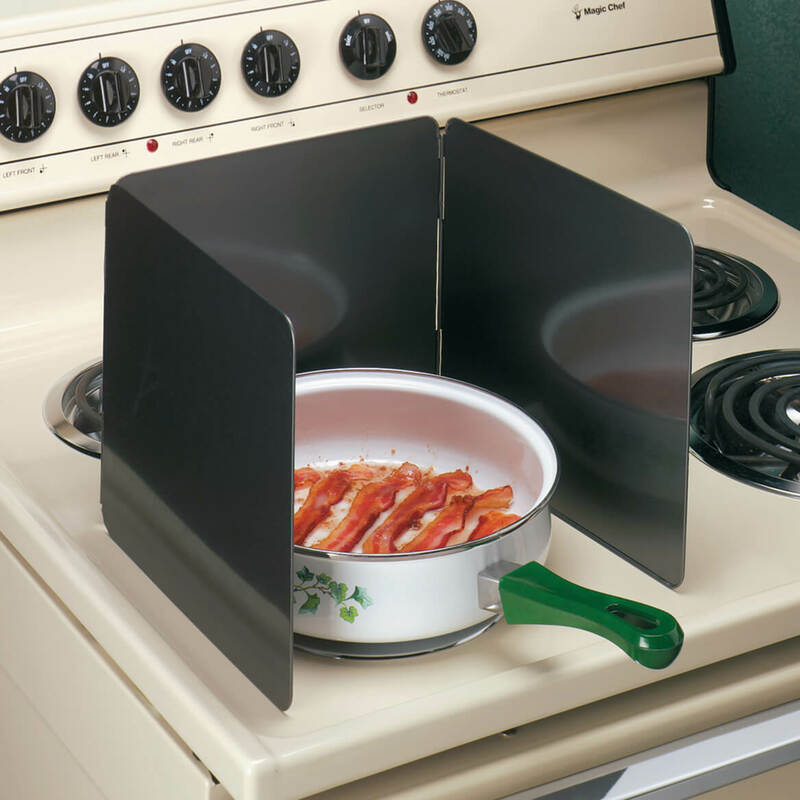 I love this splatter shield, it helps my wall and stove from food splating. Repeat purchase! I have this product and I love it so I'm buying more. Nice rolled edges keep from cutting hands. Black finish will not rust. My store in in the a Island and this is a great idea to stop grease from falling to the floor. We cook on the griddle quite often and this would help prevent spatter from getting on the back of the stove and surrounding counter tops! Had mine for years so it's time to replace them. Great to keep oil from spattering all around the stove. Will come in handy frying things. Got a new smooth top range and felt this would help keep the top spatter free. How many come in one package? 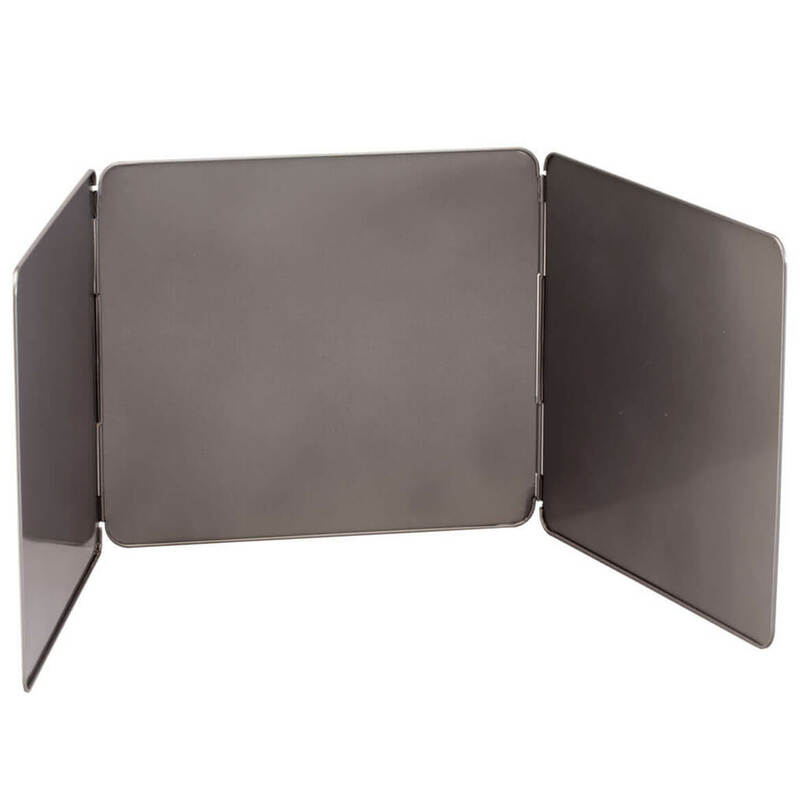 BEST ANSWER: Only 1 in a package, it is hinged together, and folds flat. Only one shield comes in a package. I needed two, so I ordered two packages. Does this work on glass flat top range? BEST ANSWER: Yes it does; quite well, in fact. I have a glass top electric range and it keeps the grease spatters confined to the shield and the pan in which I am cooking. You do have to be careful when reaching over the handle of your pan so you don't knock it over, but I did not find that was really much of a problem. Lots of luck with your spatter shield! I also put my spatter shield into my dishwasher for easy cleaning. I think it would. The bottom sits flat on the surface of the stove., so I don't think it would be a problem. I really can't see why it wouldn't work. For the price, it's certainly worth a try. Thank you for your question. The splatter shield is 9" tall. We hope this information will be of help to you. Mascara shield & guide is specially curved for easy use, allow flawless application, protecting freshly applied makeup and delicate skin around eyes from excess mascara. Plastic; 5" long x 1 3/8" wide.